Never again. I will not eat a burger against my better judgment. This is not a condemnation of meat, or even burgers in general. It’s a red flag raised against our food system and its inherent dangers. Every year, 3,000 Americans die of foodborne illness, 128,000 are hospitalized and 48 million get sick. I knew that. I knew better. And still, I ate that burger, too pink on my plate (not that pink necessarily means underdone; the only true telltale is a thermometer, which should reach 160 degrees). It had been a long day, ending in hunger and a rare craving for beef. So we went out to a little place down the hill where I could order a grass-fed burger with sweet potato fries—indulgence. But not for long. At 2 a.m. I awoke with an awful, gnawing nauseous feeling in my gut, a feeling I’d felt before. The churning made me stagger out of bed. My mind turned back to the conference I attended at MIT in 2011, the Knight Science Journalism “Food Boot Camp,” with four days of speakers and no small focus on foodborne illness. I kept thinking about the talks that week. Like J. Glenn Morris, Emerging Pathogens Institute, University of Florida; and everything he said about enterohemorrhagic E. coli. “It is a foodborne disease where prevention is the absolute key.” Antibiotics won’t work. The only surefire cure is cooking the bejesus out of those pathogens. “I put meat thermometers in my hamburgers,” Morris said, just as all the experts seem to say. I couldn’t see the cooks who made my burger; I have no idea how they checked it for readiness (or not). My stomach growled, I ate the burger, and six hours later I sat wide awake, wondering how the night would pass. Of course, food poisoning is not just an American phenomenon, and I’ve certainly experienced my time with the porcelain god in dubious corners of the developing world. Five years ago, almost exactly to the day, I awoke in the dark at the foot of the Himalaya, in an ice-cold room. I spent hours that night on the ice-cold tile of an ice-cold bathroom. Ice framed the window we had facing Kanchenjunga. My sickness lasted days, and so did the cold. It zapped my appetite and all my energy. Hours earlier, we had stepped inside a dim dining room, one of few places we found open for business on a quiet street of Darjeeling. The young waiter wiped my plate with a damp gray rag—and I knew. That rag smelled of mold, it smelled entirely wrong. But we stayed and ate anyway—because it was late, it was cold, we were tired and hungry and there was nowhere else to go. And because, in life, and on the road, you take chances all day long—big things and little things, and things that mostly never result in catastrophic consequences. But every now and then they do. It’s a wonder so many people survive the environments in which they eat and live, especially in India. But then, Indians eat a diet evolved through thousands of years of treating illness with food—rich herbs and spices that help to counteract the pathogens that battle our bodies inside. Daily meals in India are loaded with turmeric, garlic, cilantro and ginger — all of which, modern science shows, have qualities that effectively fight foodborne illness. I’m not saying a bowl of curry will erase E. coli and Salmonella and Campylobacter from all the world. But yes, a traditional fragrant curry can help. Here in the US, though, many of us tend not to cook that way—not with regularity, and not to the extent of other cultures with heavily spiced cuisines. Here, instead, we raise our animals in confined spaces and slaughter them en masse, in conditions rife with contamination. And then we eat thick patties of ground meat, which are particularly susceptible to pathogens because all that surface area gets tossed and turned and mixed and rolled into the formation of a burger (steak, by contrast, was widely thought sterile inside, but research shows Salmonella can work its way in there, too, and heat won’t necessarily kill it as easily as in ground meat). We eat that plate of meat with a side of fries, pickles, ketchup and mustard. No cumin, fenugreek, basil or oregano. And many of us still choose our meat pink (the other night I did not, but it came that way anyway). So there I sat on the living room chair, at 2 a.m. eating ginger by the slice. 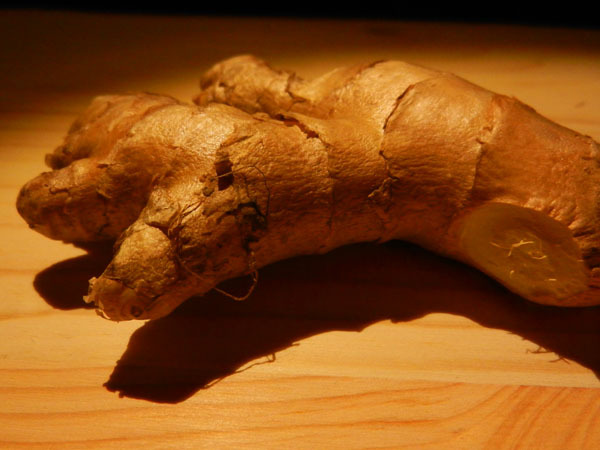 Ginger: perhaps the world’s oldest remedy for an upset stomach. The science even shows it’s effective in fighting the nausea associated with chemotherapy. In the end, I didn’t have anything as bloody awful as enterohemorrhagic E. coli (if I had, I wouldn’t be writing this right now). And I’ll never know for certain what tainted my belly. I ate my ginger, drank my water and returned to bed. I felt a little off the next day, but survived nonetheless. And I’m sure many folks will see these arguments (mine and others’) as needless fear mongering in a world where people have survived ages of pink burgers and rare steaks. But I don’t like the way I felt that night, wondering whether I could keep down my dinner. In this country, steering clear of questionable meat is one effective way of minimizing risk. In the future, I will not eat suspicious meat. And believe me: neither will I ever again eat from a smelly rag-smeared plate in India. But I will eat ginger and curry with vigor. Your Mum-in-Law bought me a top drawer fast food thermometer. I have used it numerous times since being gifted and it WORKS! Would you like one? Merry Christmas. Idea from your Bro-in-Law, the BBQ person. Especially critical for chicken. Thanks! We do have a thermometer. I never considered taking it to restaurants… now that could make an interesting blog post on all sorts of levels. I carry the ginger candies in my bag, but I make tea from fresh ginger for tummy upsets. You are right. We’ve forgotten the natural cures that got us this far. We’re not as conscientious about washing our vegetables, eggs and fruit, or being careful about what we eat. When we grew and raised our own, we were better about it. I would never eat from a plate that was wiped with such a rag. Now I wonder why he felt the need to wipe it. Yick! Thinking of you; admiring you; wishing you well. Thank you, Limner. I do believe in gut instincts. 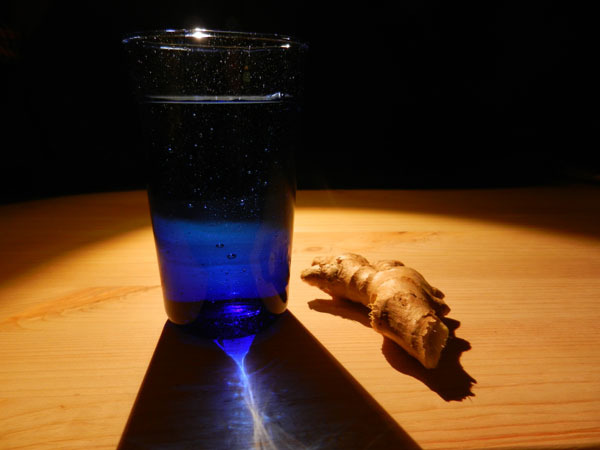 And yes, ginger tea… especially on a cold night. You are right about being conscientious. But also, these days we face potential hazards that simply didn’t exist in years past. This Kansas City Star report on the beef industry’s mechanical tenderizing process is a must-read for anyone who eats steak (uncanny, the timing!) http://bit.ly/XJPBct. I’m so sorry to hear about your terrible food poisoning experience; I guess its bound to happen once in a while. Even more scary than poor health and safety standards is US progression towards cell grown burgers; read this: http://stemcelltherapyreviewjournal.com/dr-mark-post-and-his-stem-cell-hamburger-meat. Ginger is incredible, i should write and article on it soon, especially with Xmas gluttony coming up! Wish you a quick recovery!